Some bugs reported involved the Autohiding topbar feature which reactivated the favbar after it slides out again , i fixed that and while beeing at it i revamped the system a bit , whenever the topbar hides now or parts of it hide , the toolbars will slide , like on the pic below which awesomely demonstrates how clean my UI can be if Autohiding Topbar is on , if i would be a shortcut junkey now and remove all my Toolbar buttons , i wouldnt need a User Interface checkbox in Snapshot floater anymore as my UI is hidden anyway! oh and...something special... i fixed the Volume Pulldown , it will appear below the button again , not correctly centered but it appears below it! , will fix it that it will show up centered next time ... atlast its usable again! but it only works (Captain Obvious stating the obvious now) for objects you have taken on the SIM you are on. There must NOT be a relog inbetween this take action and your try to restore it! I remember someone suggesting me the restore to last position feature of other Viewers.... so i reactivated it ... yes , it was there... all the time... it was just deactivated because of a DEV-XXXXX Jira entry , i dont know what this DEV Jira entry said as it is not available anymore , but hey! we got the feature back! Umm ... every time I right click a HUD on my screen to relocate it, the viewer crashes. Standart Question: Cleared Cache? Cleared Settings? No worries. It's a clean install but I then modify some settings to be event hostess friendly; camera is rear view and closer and flatter (-0.125 and 0.125), I turn up meshmax threads to 64, rendervol = 5.000, and my chat bar and all my icons are on the bottom bar. I cleared cache and settings and everything was fine. I started to change the settings to my usual (to the same settings I use with other viewers) and as soon as I switched the camera to rear view and brought it in closer to the avatar ... CRASH! Relog and rotate camera ... CRASH. One of the earlier original LL V2 builds used to do this too. I'll try your viewer again after your next build. Keep up the good work! I'll get those for you when I get home from work this evening. 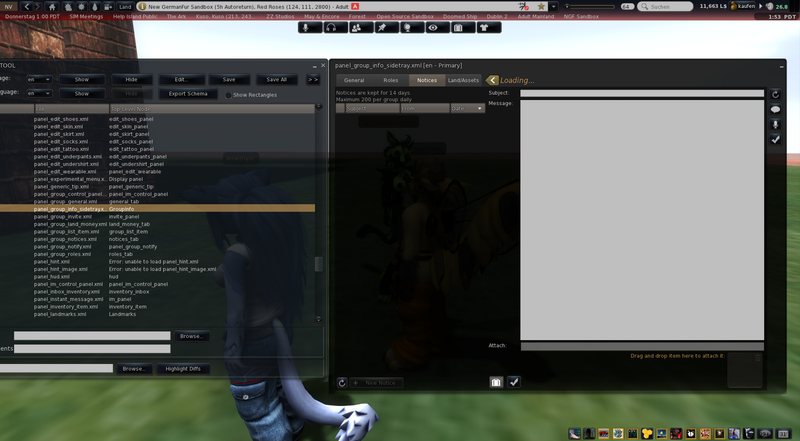 Crash logs sent in notecards inworld (2 notecards/crash).